Piddling little land deal ? If Ashley has gained personal millions from said land deal it’s far from piddling. There’s also the possibility that it has stopped Newcastle United from extending the historical cathedral on the hill StJames’ Park. Online Guy do you have any sources in the council that could give you good inside information? Only info that can be released to the public domain at moment . Official channels ..There’s no whistle-blower I know of . I do know the lawyer that was handling the sale …I asked him some leading questions 2 years back almost, and he gave me the impression he was walking on eggshells in trying not to deliver answers . It was hard for him and he spoke as though the gestapo were tapping his phone. Loyal to his client. I learnt a few things and the figure it was going for then ..around £6.5 million, this is not accurate as Iv been told a differing figure as of recently so don’t know what to believe . I will be digging in the week. Did you ever give Charnley a ride in yer Taxi ? We did lay the foundations for the civilization you have today. Have we been sold yet? How long do you think they can leave the obvious end to the sale lie before they make some kind of statement ? Who do you think MA will pretend to sell too next year ? You think Donald Trump could be persuaded ? All of those times he was going to sell us ? Ashley has about 30 businesses networked around Newcastle United ..all money streams ..I want to know where each pound is going and how much Ashley is taking and sticking in his own personal bank account. Is he bleeding the club dry ? We are complicit in helping him to get richer by attending each home game. Wetting yerselves over one signing . Remember the V sign ? That’s what he thinks of Newcastle Supporters. V sign . V two fingers V sign . Where’s the money gone. Where’s it going ? What lie will he use next Winter >? was feeding you info re the sale about it. have you ever had treatment for schizoid tendencies ? Who paid £2.4m to whom? Could it’ve been MASH Holdings paid that to the Club before the land was sold on for god knows how much? I don’t know, perhaps you could provide chapter and verse? You asked Online whether he’s ever had treatment for schizoid tendencies? That’s priceless coming from you. It was the figure I was given at the time . 6.5 million . Anyway where did you get your figure from ? I did state that I deemed it not to be accurate as I heard a conflicting figure. Its possibly much more for prime land . It’s not piddling as you say . And certainly not a piddling bit of tarmac as you stated ..
I’m writing in a freindly manner and your levelling schizophrenia at me. Bugger lugs ! I like you as a Gadgee Jib but seems like your in the Ashley camp now . You have made it clear over this land sale that you are in the Ashley camp. Jib loves Ashley ties in with the Mills and Boon theme that has been running through the blog this evening . There’s a Barnes working for Marrico. Are we still being sold ? Or is this years lie over now ? You think the entire fan base just cant wait till Rafa is shoved out the door and MA does his usual rinse and repeat ? You think buying one player for less than you sold one player will end any protest ? Let’s go with what your saying …the sale of land was 2.4 million… was that the initial figure that Ashley sold it for to one of his own companies that his Brother is part owner of ? Ashley buys it back at a slightly higher figure and he buys it off himself and a company the brother has a percentage of, then he sells it to a company that his brother also has a few fingers in and a Barnes is involved with for an astronomical sum of millions ..
I’m just putting that out there in order that it can be discussed and refuted ..it gets it all scrutinised and some truth should come out of it. Any inaccuracies about who knows who and figures are all to create the debate. Who telt you 2.4million ? I think Ash sold the land to himself via mash holdings, thus taking it away from Newcastle United ..then sold it on at a lowish price to a company he has connections with and in order to look ethically responsible and not making too much personal profit ..BUT …. he already has a deal in place to buy it back on the cheap ..thus moving it around various companies ..he waits his time until questions cool . He then sells it on for vast personal profit . You told me categorically that you are Jane . Bout 6 months back . Anyway I think you dropped yerself in it as you answered a Jib question with Jane giving the answer ..you forget to change your log in name. Longstaff and Hayden have played together in tandem pretty much as two central Defensive Mids. Nothing at all elaborate about what they did. Got goalside and tight, got challenges in, laid the ball off to a black and white shirt, moved into space to support. This is great against the senior sides and worked wonderfully v City, where they were instrumental in what may well prove to be the pivotal game of our season, the one that keeps us up. Against lesser sides that don’t come on quite so much, we need a bit more on the ball. Hayden, as impressive as Longstaff, wants away and maybe doesn’t have quite the same engine and physicality nor scoring potential particularly from range, so I hope to see Longstaff start alongside Ki in midfield v Wolves, and continuing to keep it simple, while Ki knocks it about in his own remarkably metronomic way. Although I think Rafa is most likely to keep the same starting line up, I wonder if he will try to fool expectations and revert back to 4231 with Diame possibly as #10 or push Longstaff forward. 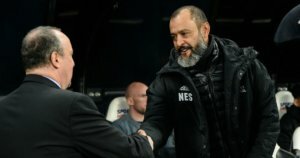 It just depends on how he believes the wide men of Wolves are best counteracted, as they have been more succesful against open teams above than below. Keeping things tight with a rigid and organised defense has got to be the most likely option prior to working on alternatives over the ‘break’. With particularly the experience of the last two matches, the squad should remain the same whilst being more ready to use substitutes and would seem to be the perfect antithesis to the free flowing offensive movement of Wolves. I am cautiously optimistic of a positive result whilst knowing from previous experience that such a feeling is usually fatal.